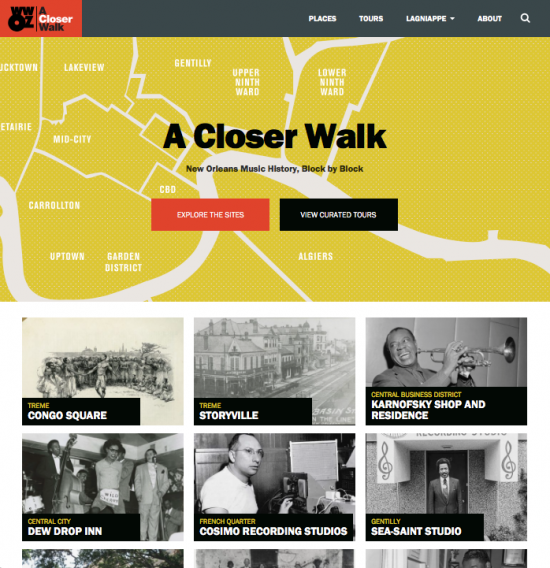 We’re excited to introduce you to A Closer Walk (ACW), an interactive map of New Orleans music history sites at ACloserWalkNOLA.com. 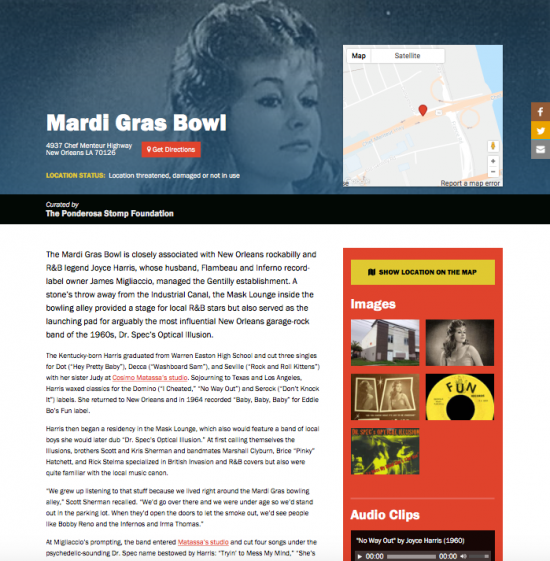 The Stomp has teamed up with WWOZ radio, Bent Media, ePrime Media, and author Randy Fertel to tell the story of New Orleans’ greatest musical places, people, and moments in pictures, audio, and video. ACW is mobile-optimized, with an intuitive design that’s easy to use on a desktop or on your mobile device as you navigate the city using GPS. Filters let you find historic sites based on your interests and location — for example, clubs where the Meters played in the 1970s, or landmark record studios within walking distance of you. Pre-curated tours are available, too. A team of experts has written and selected the best available content about each location. You can read descriptions by acclaimed music writers like John Broven and Jeff Hannusch, see rare archival photos of sites in their heyday, listen to music and oral histories with artists, and watch music videos and interviews. Links to related books, articles, and documentaries let you do deep dives on your favorite subjects. ACW is a first-of-its-kind collaboration, with specialists drawing material from personal holdings, community-based collections, and institutions including the Amistad Research Center, the Historic New Orleans Collection, Hogan Jazz Archive at Tulane University, Louisiana State Museum, and the New Orleans Jazz & Heritage Foundation Archive. On ACW you’ll find everything from Allen Toussaint’s business card to photos of female impersonators on stage at the Dew Drop Inn. ACW has been years in the making. Early on, the Ponderosa Stomp Foundation partnered with project manager and technology solution provider Bent Media to design a site focused on postwar music history–Bent worked with the Stomp on the landmark exhibit “Unsung Heroes: The Secret History of Louisiana Rock ‘n’ Roll,” which was featured in the Louisiana State Museum from 2009 – 2014. Later, community radio station WWOZ brought us together with ePrime Media and Randy Fertel, who were chronicling the history of traditional jazz in New Orleans. Merging our efforts yielded ACW, which covers New Orleans music history from Buddy Bolden to Juvenile. For too long, accurate, comprehensive information about New Orleans’ musical legacy has been hard to find. While the city has a wealth of historic locations, many are unmarked, hiding in plain sight. ACW establishes a network of sites, like a digital version of Mississippi’s “Blues Trail,” to highlight their significance and, by recording the current condition of each, to advocate for their preservation. This October, the Ponderosa Stomp Music History Conference and Concert are walking distance from each other, and from dozens of historic sites in downtown New Orleans. With ACW, you can customize a tour — say from your hotel to Cosimo Matassa’s storied recording studios in the French Quarter. Or hop in a car and check out Fats Domino’s Lower Ninth Ward compound and Ray Charles’ favorite spot for gumbo. We’ll be adding new sites to the map before the Stomp, so find us at Facebook.com/ACloserWalkNOLA to keep up with the latest. 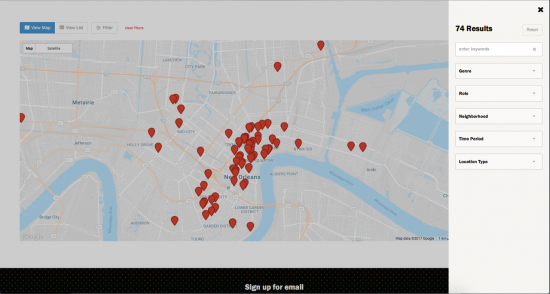 Our goal is to present 300 landmarks on the map in honor of New Orleans’ tricentennial in 2018. To learn more and support the effort, email jordan@ponderosastomp.com. If you haven’t made plans for this year’s festival, now is the time!